Abdel Casiano remembers being a teenager whose high school graduation was approaching quickly. An average student with no plans after graduation, Casiano walked across the stage to receive his diploma knowing he had to come up with a plan fast to avoid being stuck with nothing to do. If he didn’t, the rough streets of Newark, New Jersey and the pitfalls he was already familiar with awaited him. “Having zero interest in college at the time, I made the decision to enlist and join the Navy,” said Casiano, now a South Campus veteran success assistant. Becoming a veteran is an honor for past service members and Veterans Day honors those who sacrificed to serve their country, said Casiano who added what the day means to him. “Veterans Day encompasses all that service members have done for this country, also what this country represents, what it stands for [and] its accomplishments, all embodied into one day,” he said. Casiano’s journey in the military first took him to basic training at the Naval Station Great Lakes outside of Chicago to become a sailor in the U.S. Navy. “My first experience of a naval carrier was being flown on to a naval carrier by a shipping plane,” he said. “I’m being led down a flight of stairs because a carrier is so massive, and then the next thing you know I was supposed to go be a fueler, but I was next to an aviation ordnance master chief who said ‘No, I like this guy, so put him in ordnance,’” Casiano said. For eight years, Casiano rose through the ranks of the Navy, but on his journey, he experienced a fork in the road. He received orders for a popular ship and a specialist school, which was next to impossible to be assigned to but wasn’t sure of the responsibility that came with the new position. “If I go to the ship, I could be an assistant leading petty officer and lead junior sailors,” he said, but add that he didn’t feel comfortable doing that at the time so he turned it down and decided to leave the military. 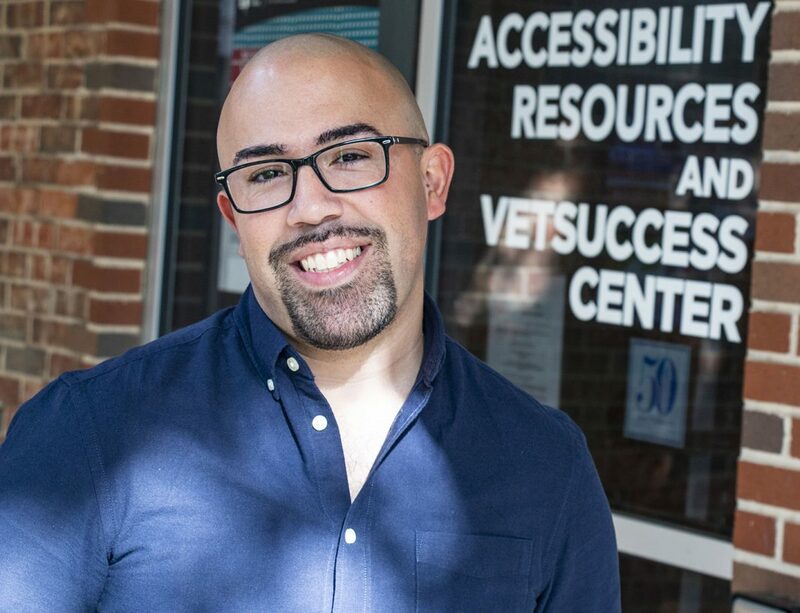 Casiano wonders how different his life would’ve been if he had the support system he has now with the veteran success center at South Campus during his military career. “Now with what I know that I’m capable of doing looking back, I would talk to my younger self: ‘Hey, it’s a possibility absolutely that you could’ve did the job and been successful if you had just given yourself the chance,’” he said. Transitioning from the military to civilian life and then into higher education can be rough for veterans. South Campus veteran counselor Valerie Groll wants veteran students to know that they do have someone in their corner with VetSuccess, which is available to students throughout the TCC district. “My job or our job here at VetSuccess is to provide support that the veterans need in order to make the transition a little smoother,” she said. After becoming a civilian, Casiano tried his hand at becoming a law enforcement officer but ended up becoming a detention officer at the jail in Grand Prairie, Texas. With three months left on the job, Casiano was tired and worn down from the long hours he had to put in. He still had dreams of being a police officer but didn’t want to go to college due to his performance in high school, but then Casiano got a word of advice and encouragement to at least try from a loved one. Casiano’s wife said she would be by his side during his higher education journey and recommended he go to South Campus. He took his wife’s advice, went back to school and is now a graduate of TCC.